The Groff Room is named for Mrs. Groff of nearby Lancaster, the mother of Robert C. Bair. 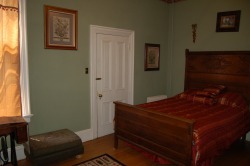 The room features an antique oak bed, painstakingly converted to a modern-sized queen, and an amazing marble mantle. It also features a built-in book shelf, an antique light fixture, lithographs and pictures of nature and hunting scenes, and private access to the second-floor balcony. The exquisite boarder is a hand-made silkscreen print. With its green walls and handsome decorations, this room has a bit of a hunter’s lodge motif and is perfect for the adventurous visitor.